Delegate: Yann-Hervé De Roeck , France Energies Marines. Although in 2018 the French regulatory framework has been notably simplified by the adoption of new laws and decrees that apply to all offshore renewable energies in order to facilitate and accelerate the deployment of offshore wind, several ocean energy pilot projects have been cancelled or postponed due to economic considerations. However, more prototypes have been tested in French waters over this year than in previous years, partly thanks to the current availability of four grid-connected test sites (SEM-REV, SEENEOH, Brest-Sainte Anne and Paimpol-Bréhat) and the continuation of the Ushant Island pilot site, which is highly representative of the assets of tidal energy in the local energy mix for non-interconnected communities. In France, the Energy Act (Loi de Transition Energétique pour la Croissance Verte), adopted in August 2015, defines an aim of 40% renewable energy in the electricity mix by 2030. The application decree called “Pluri-annual Energy Policy”, which sets 10-year targets for installed capacity for all types of energy used in electricity production, was due to be updated in 2018, and every 5 years subsequently. Separate but comparable documents are defined for the mainland as well as oversea regions and territories. Distinct figures of installed capacities and timing for calls for tenders will be given for both bottom-fixed and floating offshore wind energy. The Ministry for an Ecological and Solidary Transition is in charge of setting these goals and completed a number of legislative reforms facilitating and accelerating offshore wind farm development processes (law 2018-727 and decree 2018-1204)at the end of 2017 and in 2018. However, for ocean energies, the mention is limited to the availability of public incentives for prototypes and pilot farms of converters until the LCOE of these technologies is demonstrated to be commercially competitive with respect to other renewable sources of energy. In the Hydrocarbons Bill (which bans further drilling), published in January 2018, most sections support renewable energies by simplifying their deployment. Specifically, for offshore renewable energies, the cost of the export cable will now be supported by the French Transmission System Operator, which also takes over more legal and financial responsibilities with respect to the availability of the exportation of electricity. Finally, in the Society in Confidence Act, adopted on 10 August 2018, which is dedicated to streamlining the legislative and legal framework for offshore energy projects, a so-called “envelope permit” has been adopted allowing project developers to ask for technological flexibility in their permits through an impact assessment based on the worst-case scenario. This procedure would also move most of the legal obligations (preliminary technical studies, initial environmental assessment, and public participation) upstream of the actual permit issuance, thereby considerably reducing the risk for project developers as long as the technical details of the project do not diverge from the initial plan. In compliance with the EU directive on spatial planning, France has pursued identification of dedicated sites for offshore energy projects, with debates conducted by the regional local authorities for public consenting. The final Strategic Seaboard Document (DSF) should be completed by mid-2019. An ongoing programme has awarded 2 demonstration pilot farms of tidal energy converters for partial support, allowing these projects to benefit from a feed-in tariff (€173/MWh), a grant and reimbursable loans: presently, both projects are on hold at Raz Blanchard. Also in compliance with EU regulations on competitiveness, in the case of a call for tenders at a commercial scale, potentially foreseen for two high-energy tidal zones which have already been identified (Raz Blanchard and the Fromveur Strait in Brittany), a major part of the selection criteria will rely on the assessed price per MWh. However, the present LCOE of tidal energy is considered too high in order to enable such a call. The Programme “Investment for the Future”, managed by the Prime Minister and, on energy topics, by the Ministry for the Ecological and Solidary Transition, is the major provider of the above mentioned incentives through grants and loans, with the selective help of three main agencies, depending on the TRL of the project (from higher to lower): Public Investment Bank (BPI), Environment and Energy Agency (ADEME), National Research Agency (ANR). Local authorities, at the regional level, also provide substantial support for prototypes and pilot projects. ADEME created a roadmap for offshore energy as early as 2010. On this basis, several calls for initiatives and projects have been launched, from system parts to prototypes of pilot farms. An estimated cumulative budget of this overall support for ocean energy in 2018 is €88 million, which includes 6 large completed or ongoing projects. New projects are expected in 2019 and the overall support to ocean energy for 2019 will depend on the projects received (it is not yet possible to estimate the allocated budget for 2019). Awarded funds by ADEME have also been directed to river turbine arrays (some at estuaries where turbines function like a small capacity tidal array). 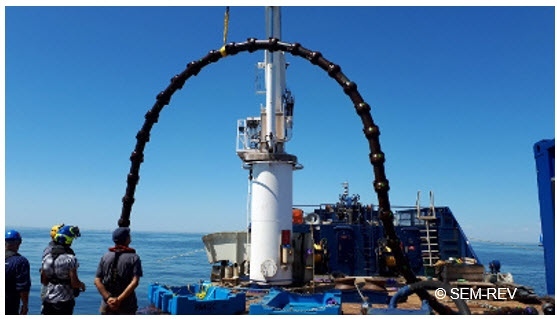 Ongoing projects issued from calls for tenders of previous years also involve ocean thermal energy converters, wave energy converters, tidal turbine prototypes and technological bricks like subsea connectors or hubs, foundation concepts, specific dredging or installation tools, etc. In 2018, ANR awarded financing to 5 new MRE R&D projects through the “Institute for the Energy Transition” call for tenders, in conjunction with France Energies Marines. These public-private collaborative projects tackle technological bottlenecks and environmental issues. In all, and over the period 2015-2018, the Government awarded €12 million of R&D funding through this programme. ANODE - quantitative assessment of the metal inputs in the marine environment from galvanic anodes used for ocean energy systems. DIME project: long-term observatory of extreme waves, using stereoscopy on a lighthouse in the Iroise Sea in order to reduce uncertainties in the calculation of wave-induced stresses. Since 2016, this programme has cumulated €5,5 million awarded to projects dedicated to local academic teams in conjunction with industrial stakeholders. Around 10 projects were launched in 2018, covering a broad range of subjects (ECOSFARM: tidal control, DYNA: advanced geotechnics, CEAUCOMP: composite ageing in the marine environment). Ifremer, ECN and Oceanides are involved in the Marinet2 project (http://www.marinet2.eu/), offering possibilities for technology developers to test their devices in recognized research facilities, including real sea test conditions. The 2nd call for projects of the Marinet2 European Transnational Access Programme was opened on 15 January 2018 – the selection procedure ended on 18 April 2018: 55 eligible proposals were received. Among these, 34 were granted access to one of the 57 available Research Infrastructures. The 3rd call was opened on 1 November 2018 and closed on 15 December 2018. Related to this topic, information concerning THeoRem, a National Research Infrastructure related to hydrodynamic testing facilities, which Ifremer and ECN (Ecole Centrale de Nantes) have joined forces to create, can now be found on the research infrastructure website: www.theorem-infrastructure.org. Furthermore, Marinerg-I (http://www.marinerg-i.eu/), a project devoted to federating in a single European Infrastructure several test sites and tanks, entered the development phase with the elaboration of a shared science plan and a design study. Each country involved agrees on an action plan to deliver necessary commitment letters by April 2019. France has now several test centres fully equipped and grid connected where demonstrators are being tested. Installation of cable cast iron shells tested in various configurations at SEM-REV. At SEM-REV on the west coast offshore Le Croisic: Floatgen, the 1st French floating offshore wind turbine has been exporting power to the grid since September 2018. In addition, in the framework of the FORESEA, Eu-Interreg project for the North West Europe area, full scale demonstrators, instrumentation and subsystems for OE are also being tested. Presently being tested are an acoustic monitoring system with SeAc (Nereis Environment) and cable cast iron shells with iBOCS (FMGC). At SEENEOH, the tidal test site in the Gironde Estuary in the city of Bordeaux (Grand Opening in March 2018), the ¼-scale HydroQuest 80 kW marine turbine is the 1st demonstrator to be connected to the grid during an 18-month test. The 2nd user is a 2 vertical axis turbine floating device by DesignPro which required only 3 h of marine operations for its installation. HydroQuest & DesignPro floating tidal energy converters tested at SEENEOH. At BREST Saint-Anne, EOLINK has successfully tested a 1/10-scale floating wind turbine for 4 months, beginning in June 2018. The SABELLA D10 (10 m diameter) turbine has returned to its pilot site in the Fromveur Passage connected to the Ushant Island grid (Brittany) in October 2018, for another 3-year demonstration programme. Refitting and new monitoring have benefitted from several EU supported projects: ICE for the redundancy of the conversion system and integration of short-term energy storage, MONITOR and REALTIDE for monitoring. In the CF2T project, new gravity based foundations will be designed. A new round of testing of the 1/6-scale Eel Energy tidal turbine was successfully completed in the Bay of Brest in March 2018. The project partners are Eel Energy, Hutchinson, Baron, Aboard Eng and Ifremer. The tests aimed at membrane and component optimisation and showed a 50% increase in performance. WAVEGEM buoy and project partners during the christening ceremony, 18 December 2018. 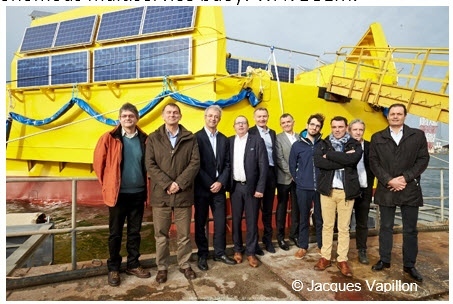 The official launch of the WAVEGEM buoy, developed within the framework of the IHES (Integrated Harvesting Energy System) project, took place in Saint-Nazaire on 18 December 2018. 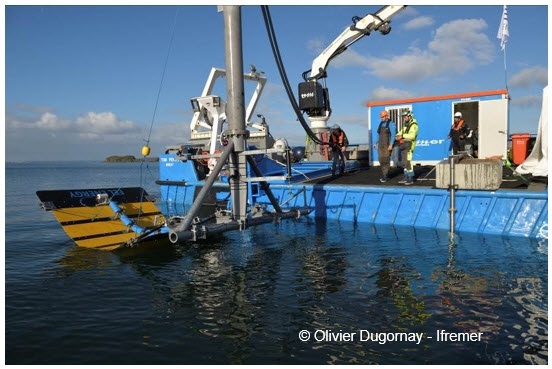 One of the objectives of the IHES project, started in 2015 with funding from BPI France, was the design and test of an autonomous multiservice buoy: WAVEGEM. The project is led by Geps Techno and involves: Chantiers de l’Atlantique, Blue Solution (Bolloré), Centrale Nantes, ICAM, Ifremer and SNEF. The WAVEGEM buoy will be deployed at the Centrale Nantes SEM-REV offshore test site early 2019. With the aim of demonstrating the availability of renewable energy solutions for an insular community of 2000 inhabitants (Ushant Island), the PHARES project will combine two D12 Sabella turbines, a wind turbine, a PV solar plant and a storage capacity to be operational by 2020. For this 7th edition, ICOE joined forces with Seanergy, the yearly event for marine energies in France, gathering 200 exhibitors, more than 3500 visitors and organized by Bluesign. ICOE 2018 was also mainly supported by the Normandy Region, la Manche Department, the urban community of Le Cotentin and the City of Cherbourg-en-Cotentin. The content of the event was supervised by two committees of international experts led by the Normandy Region through its economic development agency (ADN). Supported by the International Energy Agency (IEA) through its programme for technological collaboration Ocean Energy Systems (OES), the International Conference on Ocean Energy gathers every two years 900 ocean energy academic and industrial experts. Since the adoption in August 2015 of the latest Energy Bill (Loi de Transition Energétique pour la Croissance Verte), an objective of 40% renewable energy in the electricity mix by 2030 has been established. The multi-annual Energy Program for the 2018-2023 period is under construction and will define specific objectives in terms of marine energy. In parallel, France has accelerated its Marine Spatial Planning (MSP) by launching a National Sea and Shore Strategy in 2017. In this context at the beginning of 2018, a wide consultation based on 2500 contributions and named Mer Littoral 2030 aimed at defining a national strategy dedicated to maritime and shore issues. This consultation treats in detail the spatial planning of Marine Renewable Energy (MRE). The completed work was overseen by the National Sea and Shore Council (Conseil National de la Mer et du Littoral), but also by each of the four Coastal Maritime Councils (Conseil Maritime de Façade) at the local scale. Strategic coastal documents stemming from this concertation and defining the national strategy for the sea are expected by April 2019. Although France has already implemented spatial planning tools in the past such as the "Schémas de Mise en Valeur de la Mer" (SMVM, which could be translated as "sea enhancement plans"), they are mainly focused on small scale coastal areas. The current ongoing process thus illustrates the growing willingness of public and private actors in France to build a common strategy dedicated to the use, enhancement and protection of maritime areas and resources. State authorities driving this MSP are involved at a regional level (Regional Prefect, Maritime Prefect) as well as at the national level through the relevant ministries (Environment, Energy, Oceans, Industry). Since 2017, a simplified consenting process is effective. • If located in territorial waters, a license to occupy the maritime public domain, which takes into account maritime safety and the use of maritime territories (delivered by the Prefect). This licensing requires a public consultation which can be combined with the preceding process. • For farms rated above 50MW, an authorization delivered by the Ministry of Energy to generate electricity. This authorization is automatically delivered to the laureates of State calls for tender. In addition, the developer signs a grid connection convention with the French Transmission System Operator (TSO). The permit regarding the environment and the license to occupy the maritime public domain require the ocean energy project developer to produce an EIA and, if applicable, a Natura 2000 impact assessment. EIAs are subject to approval by the environmental authority. • The foreseen effects on the environment and human health. • A presentation of measures foreseen to avoid or reduce any substantial negative effects and compensate, whenever possible, important residual negative effects that cannot be avoided or sufficiently reduced (ARO doctrine: Avoid – Reduce – Offset). The French Government has initiated legislation and regulation simplifications for Ocean Energy Systems over several years in order to facilitate their development and consolidate their funding. For instance, Decree No. 2016-9 of January 8, 2016, allows the obtaining of a license to occupy the maritime public domain for up to 40 years. 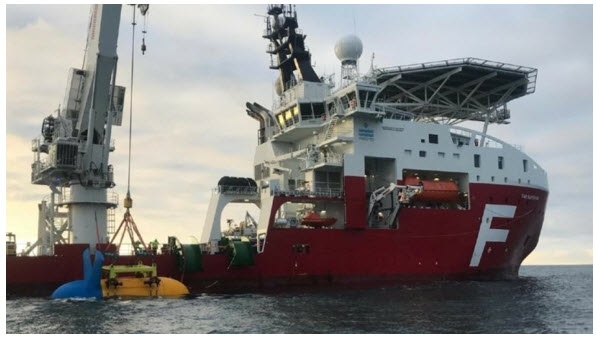 This evolution takes into account the specific lifetime of infrastructure and subsea installations, and the relatively long development time of MRE projects. Moreover, it creates a dedicated and stream-lined process for MRE project deployment requests. As a result, since February 1, 2016, a specific and unique Court (Cour Administrative d’Appel de Nantes) judges all claims regarding: Energy Code authorizations, environmental permits, licenses to occupy the public domain and decisions on successful tenders. It issues the permits for MRE developers, as well as those for the French TSO in charge of grid connections. - A guaranty mechanism protects the energy producer in terms of damages and delays. A law is currently under consideration for MRE developers, as well as for the French TSO in charge of grid connections, to allow a new procedure for an all-encompassing permit (“permis enveloppe”). With this permit, developers would not be required to determine all technological choices at the beginning of the project, but would rather define an envelope for some project characteristics. This amendment aims to increase the competitiveness of marine energy projects. According to this law, and in cases of a call for tenders organized by the State, the documenting of the initial state of the environment will be provided by the State before the opening of the bid. To grant a license or a permit authorizing an activity in the marine environment, the issuing authorities are required to take under consideration the recommendations, comments and advice provided by a wide range of stakeholders in accordance with the existing consultation processes. In addition, before the launch of a call for tenders, the French State, which is in charge of identifying dedicated sites, conducts wide consultations involving local actors, inhabitants and other users of the zone (including fishermen, sailors, etc.). During the licensing process for individual projects, non-compulsory public consultations are also organized by the developers. Information regarding the licensing process is accessible online on French governmental or MRE professional organization websites. A consolidation of processes is ongoing and MRE project developers are responsible for following the evolution of procedures for project licensing. • A power generation permit granted by the Ministry of Energy. As the consents are held by the test site, developers who use the test sites do not have to undergo the full consenting process. Developers are still required to demonstrate that they respect the test site consent conditions as agreed upon by the Authorities and the test site.